Welcome to Ward 5 Online: Voted? Let Us Know! Comment your location, time you voted and what voter number you were! 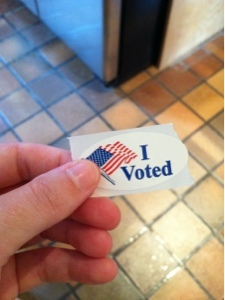 Voted at the fire station on Highland Ave. Got in line at 12:00, voted around 12:20. Was out by 12:25. #789. Had a nice time chatting with neighbors. Only disappointment was that they didn't have any stickers. Was in line from about 8-9am. In the cold. Didn't notice what voter number. The line had apparently been that long all morning. Could we please, please, please get someone that isn't really slow at looking up residents by addresses? That wait in line should have been 20 minutes or so. There were open polling stations, just waiting while the single person taking names slowly flipped through the address book back and forth a page at a time.